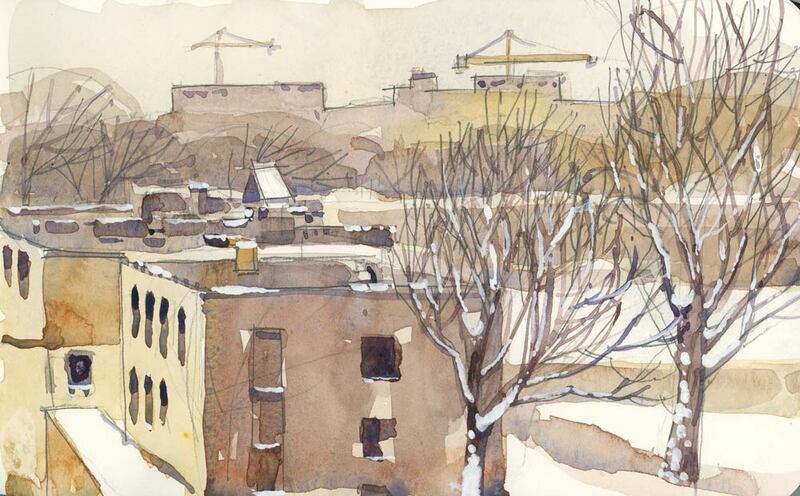 Montrealers awoke this morning to a city that had been spray painted with snow — a silent and magical spectacle. I drove to Pointe Claire to find some trees by the lake and painted near the convent. As I drew, the nuns came out the side door, two by two, on their way to morning mass. I couldn’t really hear them from the car but I can probably venture to guess what they were talking about today. 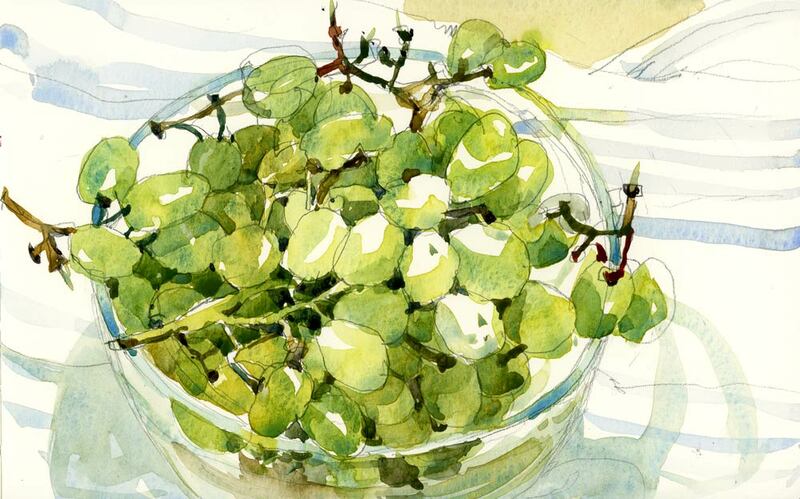 On my bedside table these days is a book by the great British watercolour painter Trevor Chamberlain. He is a member of The Wapping Group of Artists, a group who meet every Wednesday to record life in various locations on the river Thames. 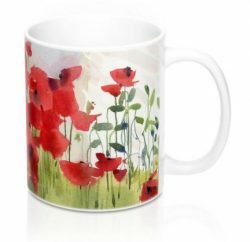 Check out their work if you want to see some extraordinary marine painting. Every night I read a few pages and I guess it gets me dreaming about painting boats in the mist. I woke up to fog this morning and that meant I had to find a boatyard to paint on my way to work. This was sketched at the Beaconsfield Yacht Club. For some reason I was thinking about scale today when I went out. There is a huge maple I have been wanting to draw. It towers over everything in the neighbourhood but it’s situated on a main thoroughfare with no parking nearby. In lieu of that I found this tall spruce. I have probably passed it many times but never really looked up to take in its height and shape. I have even sat on the terrace of the restaurant housed in that yellow building, under that wooden pergola, without noticing it. 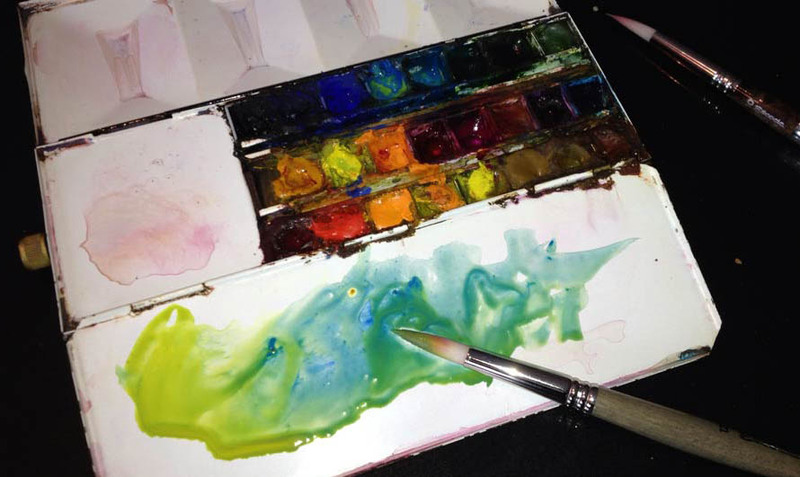 Just because it’s called WATERCOLOUR it doesn’t mean you need tons of water on your brush. That’s why I prefer tube colours to pan colours. I love the creaminess of pigments straight out of the tube. I realize that pans may be easier to transport but in my opinion, by the time you get enough water into them to get diluted, the colours are washed out. I’m sure there are those who may disagree, and I think there are even some very well-known painters, Winslow Homer included, who used pans but I have always been sold on tubes. Yes, there may be some waste if you squeeze out too much paint but eventually you will get better at gauging how much you need. And if the leftover paint is not too dry, a quick spray of water will reconstitute it. Here’s my messy travel palette, full of fresh, creamy paints. 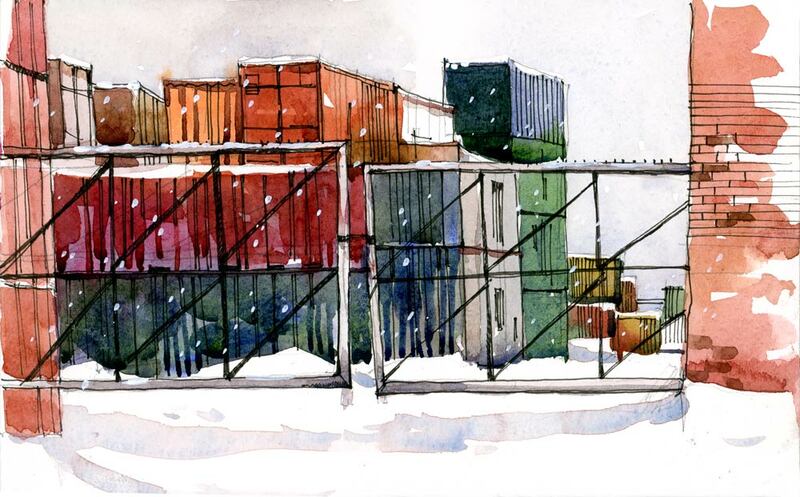 I have been wanting to sketch shipping containers ever since I watched Season 2 of “The Wire”, which centers around the stevedores in Baltimore’s port. I didn’t have to go as far as the port to find some today. In fact I pass these quite often, but during the work week you can’t often park in industrial zones without raising suspicion. On a snowy Saturday, however, the parking lot is empty and the view unobstructed. New teaching responsibilities make painting really difficult on some days.This was a super quick (brush only) sketch done from a school window. I looked out to find the kids from the school daycare enjoying the fresh snow. 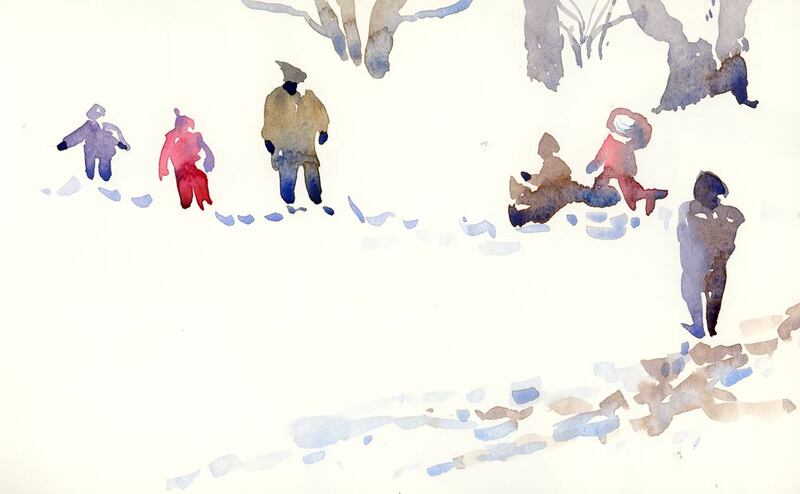 No sooner had I grabbed my brush and drawn a few of the kids in the snow than they were called back in by the teacher. This is a good exercise that will help me in the future when I want to add figures to my paintings. Looking at the shapes and drawing them with a brush is really good practice.